The day trip to Sevilla definitely wore everyone out, resulting in a relaxed and slow paced morning. In the early afternoon, we decided to take a trip to a shopping center in Malaga, but were first surprised by a flat tire on my parents' rental car! Remember, we live in the middle of nowhere with rocky dirt roads leading up to the house, likely a ditch or a rock was the culprit. 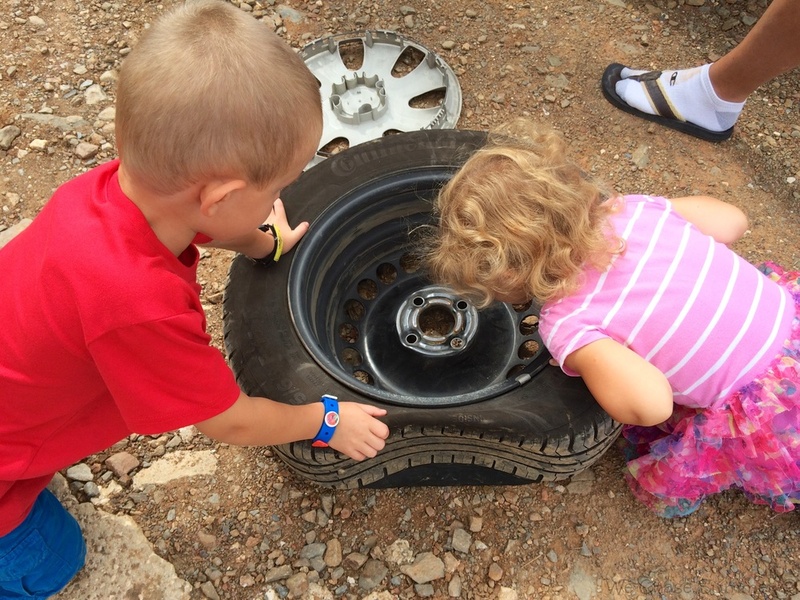 Thankfully, there was a spare tire in the trunk and the flat tire was quickly changed. The kids got a kick out of watching the entire process. 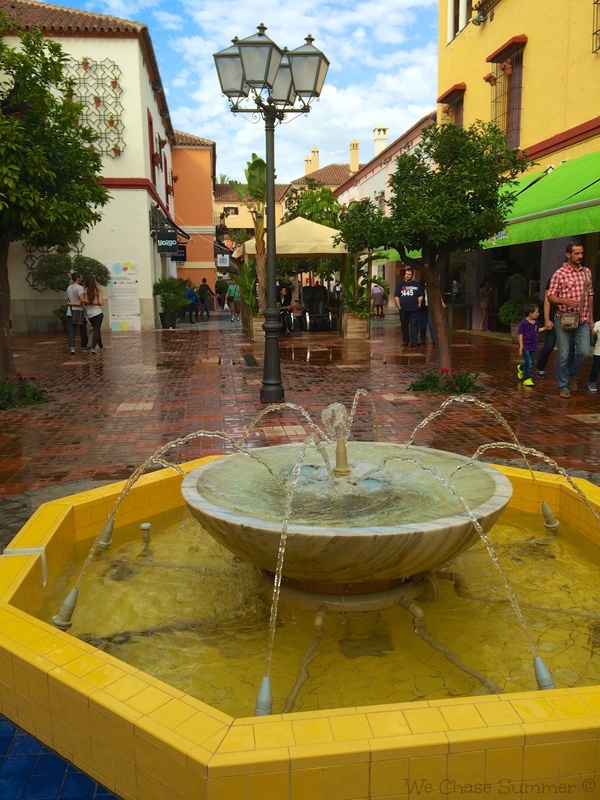 When we arrived at Plaza Mayor, an outdoor shopping center near Malaga airport, I was a bit confused as whether we were still in Spain or we have somehow, through a warp hole, transported back to America. 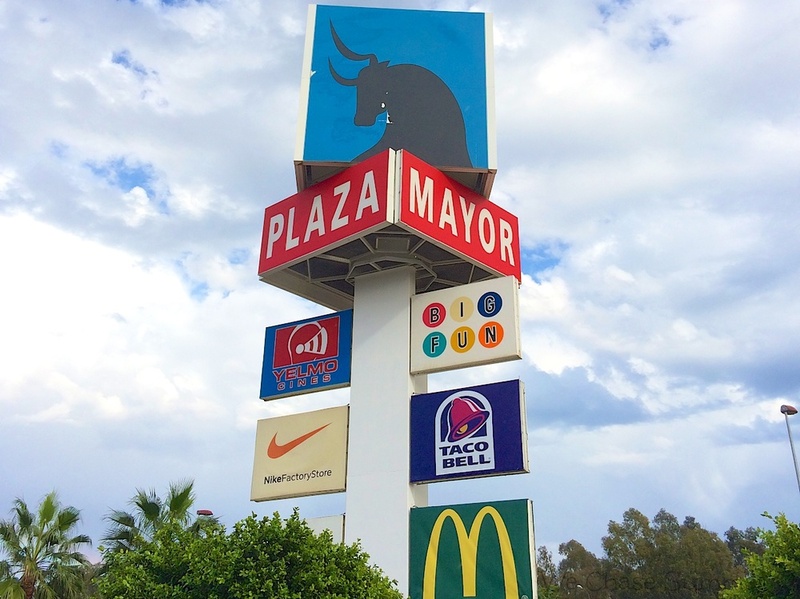 There was American music playing in the parking lot and throughout the shopping center, and most of the stores were the brands we typically see back home. There was even a movie theater (though all movies were in Spanish, obviously). 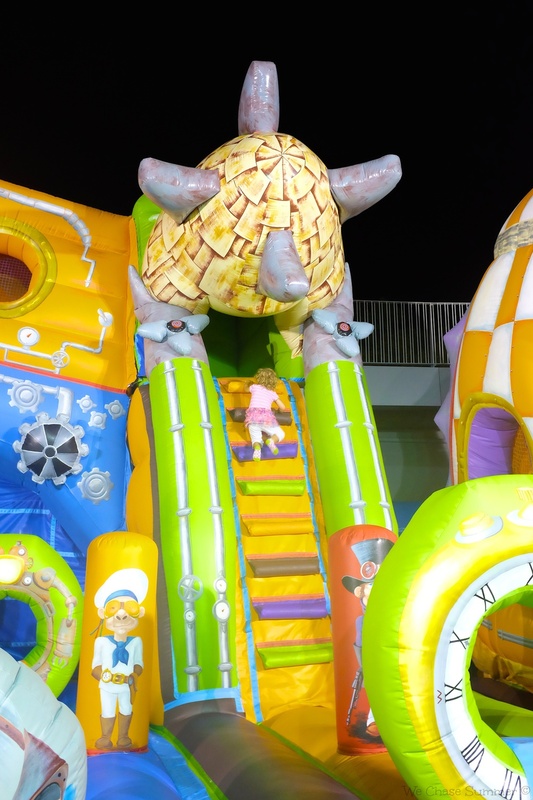 The kids had a great time here, since they have a section called "Big Fun", with a few rides and activities for the kids. Kian and Hannah were thoroughly spoiled by their grandparents and went on all the "rides". The cherry on top for the kids was a Dunkin' Donuts (or rather Dunkin' Coffee as they call it here) where they got to fill up their bellies on yummy donuts. The entire experience reminded me of a smaller version of Broadway at the Beach in Myrtle Beach, South Carolina. After checking out all the stores, we decided to head into Malaga for dinner. We ended up at Muello Uno, which is a boardwalk by the Malaga Port consisting of many shops and restaurants. It was a beautiful spot for dinner, and though the weather was a bit chilly, it was still warm enough to allow for alfresco dining. There were many restaurant options, such as Mexican, Indian, Greek, even Hibachi, but we picked a simple Italian restaurant which had scrumptious pizza and pasta dishes. The restaurant filled up quickly, making us feel good about our random choice, which was mainly made by Hannah sitting on one of the chairs and refusing to leave. In her defense, she is a pasta monster and ate lots of linguini with truffles!! On our walk back from dinner to the parking garage, we saw the coolest bounce house. I was all set to walk back to the car, but the power of grandparents allowed our munchkins to play and have fun for quite some time since there was no time limit! I have never seen a cooler bounce house, and because it was so late and there were barely any kids around, Hannah got to go on for free (the charge was only €3 anyways). I think this was mainly because at first she was afraid of the loud noise that pumped air into the "submarine", but as you'll see below she warmed up quite nicely and climbed to the top more than just a couple of times :) It was also nice that Kian played a lot with some Spanish children who were not at all phased by the language barrier, though Kian is always quick to say to other kids "no hablo espanol". We had a great time with my parents here, and we plan to come back to Malaga to explore the city more next week.